The Lesbian & Gay Community Center of Greater Kansas City and the Jewish Community Center invite you to LGBT Theatre night on Saturday, January 12, 2008, 7:30pm, at the Jewish Community Center Campus Theatre. FALSETTOS, written by William Finn ("Putnam Spelling Bee") and nominated for 7 Tony Awards, tells the musical story about a gay Father trying to keep up relationships with his son, his partner, and even his ex-wife, all told with a wonderful mix of humor and touching moments. A portion of the tickets sold benefit LGCCKC, so enjoy an evening with a wonderful show and at the same time, support your local Community Center. Tickets are $25 and to purchase email Mitch Levine at mitchmkt@aol.com. This was just a matter of time, Mischa Barton was arrested for driving under the influence, possession of illegal narcotics and driving without a valid license. From “The Naked City” to “In a Lonely Place” and “Oklahoma!” the Library of Congress is adding 25 more classic American films to its national registry. There are 12 Angry Men to be heard, The Strong Man to be viewed and The Man Who Shot Liberty Valance to be dealt with. "Even as Americans fill the movie theaters to see the latest releases, few are aware that up to half the films produced in this country before 1950 — and as much as 90 percent of those made before 1920 — are lost forever," said Librarian of Congress James H. Billington in announcing the selections. "The National Film Registry seeks not only to honor these films, but to ensure that they are preserved for future generations to enjoy," he said in a statement. The films are chosen because they are "culturally, historically or aesthetically" significant. The Naked City, 1948, filmed on actual locations in New York; this movie won Oscars for best photography and editing. It was a gritty crime film combining slices of several stories. Close Encounters of the Third Kind, 1977, an intelligent sci-fi film in which the climactic scene is set at Devil's Tower National Monument in Wyoming. In a Lonely Place, 1950, a scathing Hollywood satire with Humphrey Bogart playing a screenwriter, brilliant at his craft yet prone to living with his fists. Oklahoma!, 1955, brought the fun and famous musical to the screen. 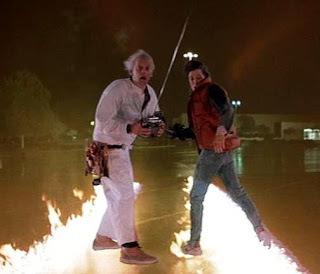 Back to the Future, 1985, explored the possibilities of special effects when a man stranded in 1955 by a time machine must not only find a way home, but also teach his father how to become a man, repair the space/time continuum and save his family from being erased from existence. All while fighting off the advances of his then-teenage mother. 12 Angry Men, 1957, a classic filmed in a spare, claustrophobic style — largely set in one jury room — relating a single juror's refusal to conform to peer pressure in a murder trial. The Strong Man, 1926, features Harry Langdon, widely considered one of the great silent comedians, as a meek man in love with a blind woman. The Man Who Shot Liberty Valance, 1962, director John Ford's last great Western. The film shows that the conquest of the West meant the triumph of civilization, embodied in Jimmy Stewart, over wild innocence — John Wayne — and evil — Lee Marvin.